Late Bloomer. Golden yellow flowers; noxious green shrub, highly invasive alien. Notes: Pea family. 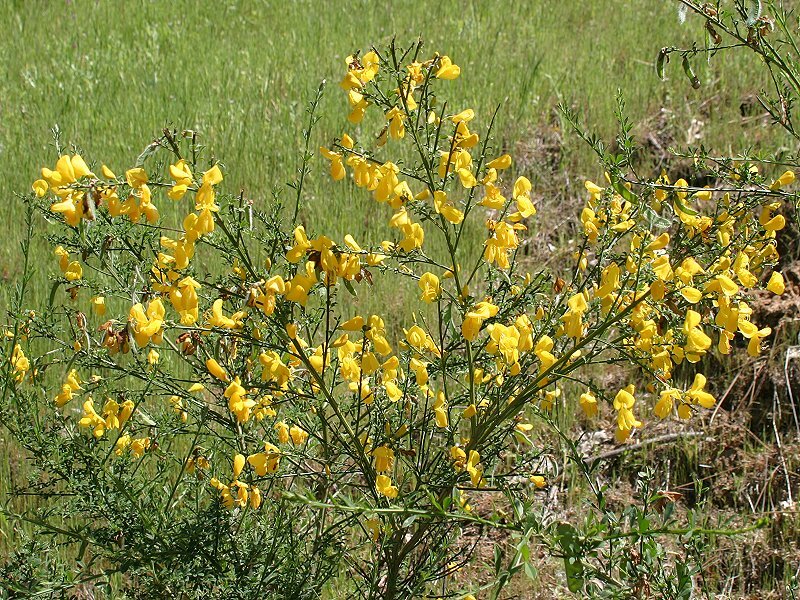 Cytisus is a Greek name of uncertain meaning. Scoparius means ‘broom-like,’ referring to the dense plume of straight stems that form a natural, inverted broom in the fall and winter seasons without flowers. ‘Noxious’ doesn’t begin to describe the invasive nature of this alien species. It can be called the ‘plant that is eating the West.' It is still sold in nurseries because it does give a blanket of bright color. However, in the wild the blanket soon covers everything and chokes out native plants. A good example of Scotch Broom taking over is seen on Birchville Road north of park headquarters on the way to Tyler Foot Road and Malakoff Diggins State Park (see the second map on the Trails and Bridges page). In Summer both sides of this road are covered with Scotch Broom for miles. As a member of the Pea family, it is highly prolific and, as with so many alien species, has few known natural enemies. It was purportedly introduced by being in the packing material for cases of Scotch whiskey. When a species like this takes hold, it crowds out not only other native plants but native mammals, insects, and so on, that depend on these natives for survival. 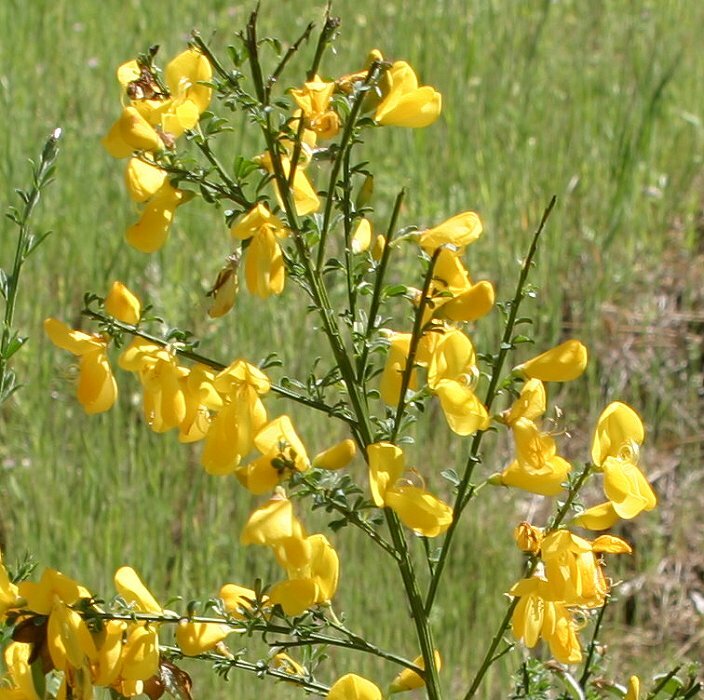 John Muir said that in nature “everything is connected to everything else.” Such evil invasive plants break that delicate connection with disastrous, often irreversible results, as has occurred for Scotch Broom. We can never eradicate it or Star Thistle, and countless others. We try to keep them at bay by pulling, or digging, them out. Burning and spraying are options but must be used judiciously, and only by those who know what they are doing. Crop to a closer view of the top flowers in above picture. Most Scotch Broom bushes are much larger and fuller with flowers than here. This less-filled bush was photographed so you can see the flowers more clearly.